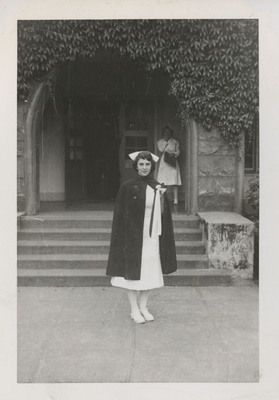 A graduate of the Good Samaritan School of Nursing stands outside the Trinity Episcopal Church before the commencement ceremony. Unknown, "Graduate Outside of Church" (1949). Good Samaritan School of Nursing Photographs. Image. Submission 229. This is a scan taken of the back of the photograph. This image contains some descriptive annotations, and the yellowing denotes an adhesive stain.